When the Brotherhood’s ‘bankrupt’ speaks! Yusuf al-Qaradawi has no achievement of note to brag about despite his old age. His career in politicizing religion is filled with what’s shameful and with atrocities as well as with creating crises and deceiving the credulous with his fatwas (religious edicts). This year’s Hajj (1439H) provided an opportunity for exposing more of the contradictions of Qaradawi, who considers himself the godfather of the Muslim Brotherhood whose schemes, proposals, lies and truth as a terror group has been exposed. The mufti and preacher of terrorism “offensively” tweeted against Qatar’s pilgrims, claiming that God does not want their Hajj! Is he being rude to God, or did he make this statement because he is an agent and follower of the two-Hamad regime? Or is this a result of decrepitude which he, Qatar and the Brotherhood suffer from? Qaradawi’s tweet is a clear example that this destructive organization is bankrupt. Qaradawi has exposed himself and the Muslim Brotherhood and revealed the extent of his ignorance and fake ideas. When it comes to Qaradawi, this is not surprising. He has satiated the world with his shameful fatwas that have claimed that “jihad” is necessary against all Arab and Islamic regimes and that permitted suicide bombings. This is in addition to his stances in support of the terrorist Lebanese Hezbollah which has been established, funded and armed by Iran which the two-Hamad regime describes as “honorable”. It has been proven by facts, figures, records and photos that Qatari pilgrims were well received and welcomed. It’s clear that Qaradawi said what he said because he lives in Doha at the expense of the regime and because he wants to satisfy the latter via his heresies which no longer have any effect now that his ill intentions and conspiracies have been exposed. If only he were consistent and a man of principle. He seems to make a contradictory statement on an almost daily basis. He praises Gaddafi and then calls for killing him off. He praises the slaughterer Bashar al-Assad and then joins the “chorus” of supporting Al-Nusra Front which branched from the Brotherhood to topple Assad’s regime. Instead of being an advisor to his two losing Hamad masters and urging them to stop politicizing Hajj and deal with it like it must be dealt with as the fifth pillar of Islam, he supported their unjustifiable actions in such a despicable manner that does not sit with his claim of heading an organization that falsely states it has a peaceful role. Undoubtedly, Qaradawi is a liar and deceiver. He has, before anyone else, tried with his offensive tweet to give religious justification for the policies of the Doha regime which continued to close the door on its citizens who desire to perform Hajj. It would have been appropriate if he had advised the Qatari regime not to politicize Hajj and to allow the Qataris who wish to perform it to go to Saudi Arabia instead of tracking down Hajj registration websites and shutting them down and intimidating the Qataris from traveling for Hajj. However, there are people who find foolishness virtuous to achieve the purpose of turning back the clock. When they cannot accomplish this aim – which they know is impossible – they resort to an evil rhetoric and plan campaigns to promote “exposed” lies. Saudi Arabia facilitated and provided all possible amenities to Qataris in performing their Hajj. However, these efforts were met by stubbornness and lies from the two-Hamad regime. This Qatari approach that has been used to arouse a dislike in a pillar of Islam and to mitigate the popular Qatari discontent because of preventing them from performing Hajj will not prove effective in hiding the seriousness of the crime which the Qatari authorities committed when they prevented people from performing Hajj! A characteristic of the Muslim Brotherhood’s guides and preachers is allowing themselves what’s prohibited – they prohibit to people what God Almighty has permitted. There is no need to say that Qaradawi’s tweet indicates a deviation from religious thought. He has twisted religious texts to satisfy his Hamad masters. In the end, however, his talk is nothing more than utter nonsense. It is certain Qaradawi is only the sheikh of terrorists and the Brotherhood’s guide to delusions, destruction, conspiracy and destruction. What he said reveals the grudge he has had towards Saudi Arabia and towards the annual pilgrimage during which Muslim hearts reconcile and Muslims stand reassured in the worship of God ignoring people like him who lead to destruction. 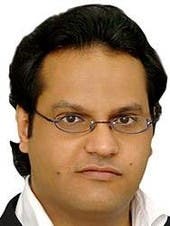 Jameel al-Thiyabi is a Saudi journalist who has held different editorial positions at al-Hayat and Okaz newspapers. Al-Thiyabi holds a master’s degree in diplomacy and media from the UK. He has spent over 20 years in the media, working first with Asharq Al-Awsat in London and then with LBC TV.